TWIF has come from humble beginnings. We started as a blog about fun things to do in Seattle and quickly evolved into an events organization, into a thriving social club, and into what we are today: a nonprofit organization on a mission to get people like you involved in your community. Below are some things we’ve done that have been recognized by the media. September 7, 2018 - The World is Fun and musician Frank Turner took over the city of Seattle on September 7 for the first annual Be More Kind Day. Inviting locals to share how they can be more kind to others, the day generated over 100,000 online impressions. #BeMoreKindDay was the #1 hashtag in Seattle for the day, Pearl Jam posted a tweet about it, and Frank joined the studios of KEXP to talk about what being kind to others means to him and the world. August 16, 2018 - One of the hottest events in town, The World is Fun's Hot Sauce Fest took over Ballard to provide locals with hot sauce tastings, food trucks, family fun and much more. July 5, 2018 - The World is Fun helped generate volunteers for a post-Fourth of July firework clean up effort, in turn removing over 500 pounds of trash from Lake Union. June 15, 2018 - One of our most popular events, Know Your Neighborhood, featured the Fremont neighborhood for summer 2018. There's not many better ways to get to know your city than a scavenger hunt! May 23, 2017 - Somewhere down the line, “giving back” became associated with punishment, or earning extra credit. Amy Faulkner is out to change all that that - even though she never intended to. March 12, 2017 - "There's no better place to be than Bacon Eggs & Kegs." Chef Corey Alfano and Sam Minkoff present fried chicken and waffle nuggets and talk food with King5's weekend news team. August 24, 2016 - Chef Matt Lewis from Restaurant Roux joined New Day Northwest to whip up some biscuits & bacon fat gravy in preparation for our third and biggest event to date. It’s Seattle’s largest brunch event! 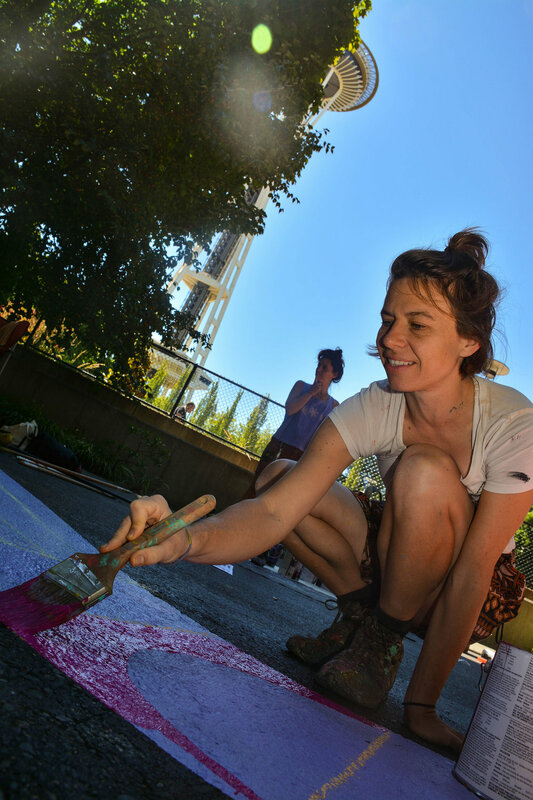 July 31, 2016 - Baltimore artists Jessie Unterhalter and Katey Truhn partnered with TWIF’s project, artSEA, to create a public ground mural at Seattle Center. artSEA’s mission is to curate public murals and other art installations throughout Seattle on an ongoing basis. Local KING TV station was nice enough to come out and shoot Jessie and Katey’s work. May 17, 2016 - Amy was selected by Washington Nonprofits and KING 5 to represent Washington State in Washington, D.C. for the annual Jefferson Awards Foundation National Ceremony. The award is meant to celebrate unsung heroes in their communities and was given to Amy for her work in building and growing The World is Fun. November 4, 2015 - In line with TWIF’s artSEA project mission to curate public murals and other art installations throughout Seattle on an ongoing basis, TWIF linked up with artist Addison Karl for a beautiful mural right outside TWIF’s Headquarters in the Ballard neighborhood. He titled his artwork “Messier” and the mural can be seen in TWIF’s beer garden outback of its offices. 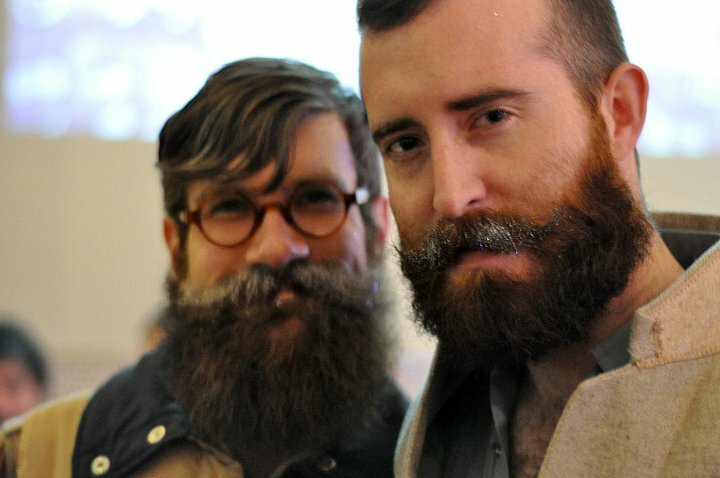 August 24, 2015 - The biggest food and drink bonanza to be held at CenturyLink Field to date, the inaugural Bacon Eggs n' Kegs saw a bevy of Seattle's finest brews and crews all in one place. September 7, 2014 - Seattle PI was nice enough to take some photos of us playing bubble fütbol at Cal Anderson Park. We’ll let you look at their photo gallery for all the information you need. September 5, 2014 - We joined New Day Northwest in their studio to talk about our awesome bubble futbol game and how it's helping Seattleites unite together.